NASA is considering using the International Space Station to practice for a trip to Mars, officials said today (March 20). The orbiting laboratory could provide a testing ground to study how human bodies react to long-term microgravity, which will be a feature of any months-long trip to the Red Planet. "Clearly, in order to be able to explore beyond low-Earth orbit, we're going to have to stay in orbit for longer than six months," space station program manager Mike Suffredini said during a news conference today. For example, as a spaceship traveled closer to the Red Planet, it would take more and more time to send and receive messages between the crew and the ground. The time delay between Earth and Mars can run from three to 22 minutes. To study how this might affect operations, NASA is planning to try out other communication technologies, including instant messaging, that might work better than phone conversations. 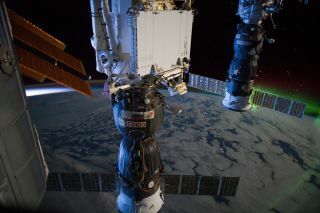 "You can imagine if we had Capcom [the capsule communicator] calling up to the crew and there was a significant delay, it's more difficult to have a conversation," said Dina Contella, lead flight director for the space station's Expedition 32 mission coming up in July. "We're really just sort of laying the groundwork and getting some of these tools ready. We're working our way up to an eventual com delay experiment." Contella said such a simulation could also involve setting up some activities and experiments to be more autonomous for the astronauts, so they would have to rely less on communicating with mission control. While NASA is starting to work toward a practice run for the trip to Mars, space station managers don't know exactly when they plan to carry it out, Suffredini said. "It won't be in the near future," he said. "It's probably not reasonable to expect us to be able to do this sooner than two or three years from now." The experiment won't be the first simulated Mars journey. The European and Russian space agencies conducted an analog mission to our planetary neighbor in 2011 called Mars 500. This project put six volunteer "astronauts" inside a mock space capsule for 500 days to investigate the physical and psychological challenges of such a mission. Additionally, other projects have sent participants to the desert, Antarctica and even deep under the ocean to simulate the experience of traveling through space.